A STORY. A STORE. A STAR. Popping up everywhere, in 1957, were snippets of news about Genesco’s acquisition of Henri Bendel - in the early part of the 20th century, among New York’s most exclusive and fashionable shopping destinations but, in ’57, a faded and forgotten relic. Newsy, but not surprising, was the appointment, by Genesco’s chairman, Maxey Jarman, of the dazzling, 30-something Geraldine Stutz, to the presidency of the store. Which came about because: After a stint at Glamour Magazine, her coverage of the footwear market brought her to the attention of Genesco (founded as the Jarman Shoe Company and later known as Genesco) who recruited her to shore up the failing I. Miller retail shoe stores (another Genesco property about which there’s more.) There, she impressed the aforementioned Jarman with her smarts, innate sense of style and an uncanny ability to ferret out the unknown-but-destined-to-be-greats. Among those talents was a rather interesting artist whom she recruited to illustrate shoes for I. Miller’s ads. Better known now for his later works, was…wait for it... Andy Warhol. Allotted five years to orchestrate a renovation of the dusty beauty, Stutz embarked on the creation of the iconic Street of Shops and put in place the Bendel guidelines; nothing over a size 10 (in today’s world, probably an 8); no labels other than the Bendel label in or on anything and, while certain designers could sell their lines to other retailers, pieces carried by Bendel had to be made exclusively for, and available only, at the store. Time progressed and Gerry used her charm, style, unfailing eye and the investigative skills of a modern- day Sherlock Holmes to troll through the hidden shops and ateliers of Paris and London where she discovered, and brought to the States, the likes of Sonia Rykiel, Jean Muir, Zandra Rhodes and Thea Porter, among others. On this side of the pond, Ellen Brooke for Sportswear Couture, John Kloss, Clovis Ruffin, Holly Harp, Perry Ellis, John Anthony, Eric Lund, Jacques Tiffeau, Donald Brooks and one of her greatest finds, Stephen Burrows, were turning out glorious little coats and dresses, sportswear and evening things found only in the world, in Cachet, Savvy, Young Bendel and Bendel’s Fancy. 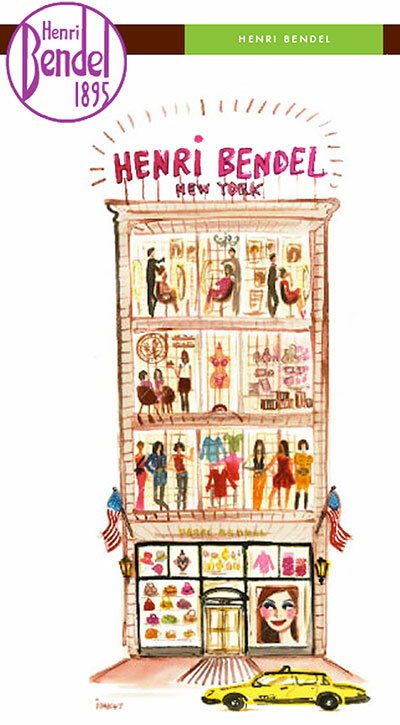 At the same time, the eagle-eyed Bendel team scouted the world for the rare and fanciful, the elegant and the unusual for the now-completed boutiques along the Street of Shops. 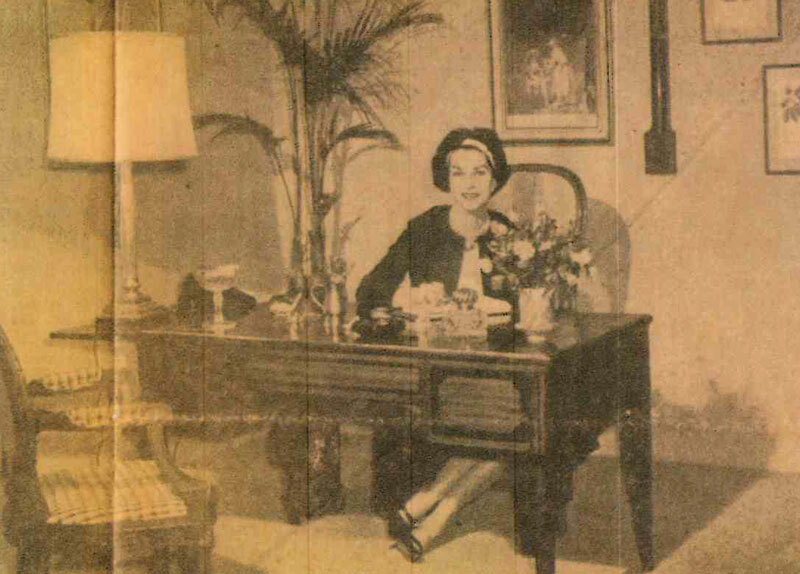 The Paper Shop had a corner for the elite among bespoke stationers, Mrs. John L. Strong. The Jeweler, all glitter and shine, tempted shoppers with Kenneth Jay Lane’s impeccable copies of Paul Flato’s 1920s clips, Seaman Schepps’ link bracelets and shell earrings and David Webb’s Maltese crosses and panther cuffs. For only the most exclusive and special cosmetic lines and Bendel’s private label fragrances – 10 West, Sans Gene, Jasmine and Checkmate, and their companion soaps and dusting powders – there was the Gilded Cage, with its own entrance. There, too, were collections of vintage mirrors, crystal perfume flacons and silver capped sugar shakers morphed into powder dusters. Art collectors, one of whom was Mr. Stanley Marcus (yes, that Stanley Marcus) added, to their collections, the small paintings and unique objets d’art offered by the little gallery, Vernissage. The Bag Shop and The Glove Shop beckoned with their “made for Bendel’s wares, as did the shop for all things hosiery, Bendel Legs – its counter managed by one Essie Weingarten, whom we later came to know as the queen of her eponymous nail polish empire. And then there was Shoe Biz at Bendel, a department leased to the irrepressible and charismatic shoe genius, Jerry Miller of the aforementioned I. Miller retail shoe stores and grandson of the theatrical shoemaker, Israel Miller. (The statues of clients Ethel Barrymore, Mary Pickford, Rosa Ponselle and Marilyn Miller, perched in niches atop the original I. Miller building on 46th Street, still look out over Broadway.) Jerry, whose madcap ideas knew no bounds, dressed his “shoe girls” in leather shorts and transparent shirts (sans bras) – a dress code that required a contingent of New York’s finest to maintain crowd control at the door of 10 West. Another incident that required some fast talking to extricate the store from potential dire consequences was an ad for a quirky little sheared fur coat priced at “650 beans.” Monday morning found a cadre of customers, bags of beans in hand and accompanied by reporters from The New York Times and The Herald Tribune (the ad had appeared in both papers) eager to claim a coat for the advertised “price.” Mencken’s Dictionary of American Slang was promptly (and mercifully) produced proving that, yes, “beans” was an accepted synonym for dollars, putting a fortunate end to the little standoff. On sunnier, oh-so-cool notes, was a letter from the managing director of The Plaza Hotel who, so delighted by the “Eloise-esque” campaign for the children’s department, Growing Up at Henri Bendel, invited the advertising director to a Palm Court tea. And then there was the fan letter from the organizers of the Pendleton Roundup after an ad likened a little western-influenced, cashmere shirt to one worn by the competitors in that legendary event. Especially memorable: Bendel’s own fur factory on the 9th floor where the courtly and elegant Swiss-born Mr. Gossweiler, used the most luxurious of furs to fashion precise and perfect little narrow-bodied coats and jackets. (For Gerry, he made a sumptuous little sable stole with interchangeable linings to match her evening dresses.) Gene Rogers, who single handedly ran the receiving department (just the basement, really) always turned a blind eye to the young fashionistas choosing (and setting aside for purchase, once some payment activity was posted on ever over-extended charge accounts) the just arrived shipments of coveted Rykiel sweaters, Fiorentina shoes and the new and revolutionary Rudi Gernreich “no bra” bras. And without doubt, unforgettable was the cheerful, smiling, helpful-in-the-rain or- shine presence of Buster, the famous Henri Bendel doorman in his Bendel brown, Johnny-On-The-Spot uniform. So, in case anybody’s wondering, now, what of the six degrees of separation as they apply to Gerry Stutz and Fashion Group there’s this: when Stutz was named to the Bendel post – at the tender age of 33 and without comparable merchandising experience, David Evins, the designer who made shoes for every first lady from Mamie Eisenhower to Nancy Reagan, and who was, not incidentally, the father-in-law of Evins Communications CEO and FGI Board member, Louise Evins, said that “Gerry was the only one who could turn that place (Bendel’s) around.” And there’s more: 1984 saw the first-ever presentation of the annual Night Stars celebration. The theme was “Women In Retailing” and among the honorees was…oh, you know…Geraldine Stutz.